Brief Synopsis – Documentary that looks at the space program from the perspective of the men and women who ran things in the control center in order to make things work smoothly for the astronauts. My Take on it – As a HUGE fan of the US space program, I was so happy to finally get a chance to see this film. Many of the personalities shown here are familiar to me from the various research I’ve done in the past with regard to the space program including other films and books related to it. THis film gives a very unique perspective of the entire space program especially with regard to the Apollo missions during the late 60’s and early 70’s. These men and women are truly unsung heroes because they would work day and night to make sure that everything was in proper working order before during and after every space mission. The chance to be able to hear the stories of men like Chris Craft, Gene Kranz and many others about how mission control came to be and various anecdotes about a number of the events that occurred during the course of the missions is great. We are able to see interviews with these men and women who chose to forsake so many things in their own personal lives in order to fulfill their duties to the space program. 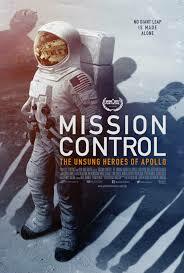 Bottom Line – Such an amazing perspective of the events of the Apollo missions. These unsung heroes worked day and night to ensure that everything work properly before, during and after every mission. Being able to hear what Craft, Kranz and the other men of mission control did during those heroic times is extraordinary to hear. The interviews give us so much depth into who these people were in order to forsake so much of their own lives to fulfill their duties to the space program. Highly Recommended!